Fairy ring is a common turfgrass disease in Louisiana caused by several soilborne fungal species in the class Basidiomycetes. In Louisiana and other parts of the world, fairy ring is caused by species of fungi known as Calvaria (coral mushrooms), Chlorophyllum (parasol mushrooms), Lycoperdon (puffballs), Marasmius (gilled mushrooms) and others. Symptoms of fairy ring generally are first noticeable as circular or semicircular bands or rings of stimulated, dark-green grass, necrotic (dying) grass or combinations of both. These symptoms may appear in all turfgrasses grown in Louisiana and can be aesthetically displeasing to homeowners. 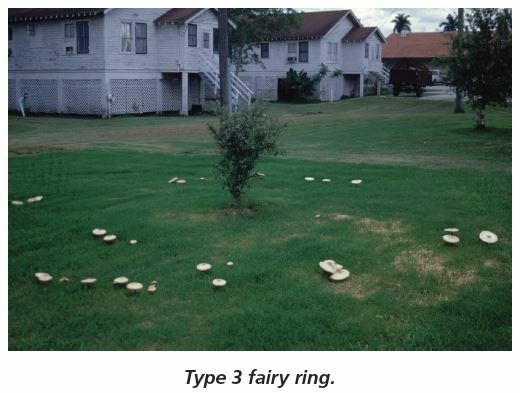 Fairy rings are further classified into three types: Type 1 includes those where the grass is killed or badly damaged; Type 2 includes those where the grass growth is only stimulated; and Type 3 includes those where there is no damage to the turf, but the fruiting bodies of the fungus (sporocarps) are found in rings, especially after a heavy rainfall. Also, three distinct zones in the band or ring can be observed: an inner zone where there is luxuriant grass growth, a middle zone where the grass may be under drought stress or dead and an outer zone where there is some stimulated grass growth. Can appear in a variety of climatic conditions. Thrives in high thatch areas and sandy soils. Lawns that are lightly irrigated and underfertilized are more vulnerable to fairy rings. Wet, humid conditions favor mushroom production in Type III fairy rings. Fungus grows outward from a central point, forming a circular ring. Can be a partial ring or arc if the fungus hits a soil barrier, such as a sidewalk, landscape bed or curb. As fungi feed on decomposing matter in the soil and thatch, nutrients are released that cause the turfgrass to turn a dark green and to grow more rapidly compared to the surrounding turfgrass. As the fungus spreads and thickens in between the turfgrass and the soil surface, it may become so dense that it prevents water penetration, causing turfgrass to turn brown or eventually die. Mushrooms (fruiting bodies) may appear in the ring during wet, humid conditions. Fairy rings can last several years. Fairy rings can also disappear and then reappear over time. Maintain adequate nitrogen fertility, and always follow soil test recommendations for proper fertility. Irrigate lawns as early as possible in the morning while taking rainfall into account. Water deeply but as infrequently as possible without causing drought stress. Drought-stressed turfgrass tends to be more susceptible to fairy ring. Aerification followed by intense irrigation may help break the hydrophobic zone and let water penetrate into the soil profile. Excessive thatch can negatively affect turfgrass growth and provide a suitable environment for fairy ring fungi. Dethatching may be necessary to improve turfgrass growth. 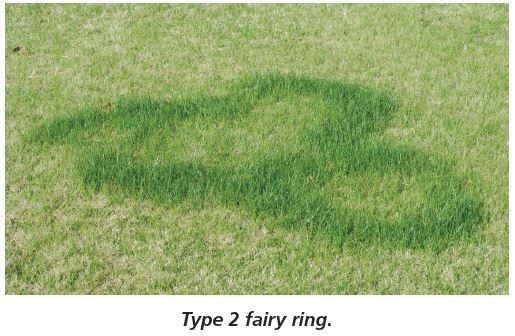 If fairy ring is established in the lawn, removal of turfgrass and soil may be necessary. Mushrooms present in the fairy ring can be raked and disposed. There is no effective chemical control available for homeowners.